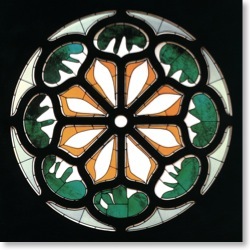 UNION CHURCH was built on the Rockefeller family’s land adjacent to Kykuit, the family estate, and is most famous for its stained glass windows, also commissioned by this distinguished family of patrons of the arts. The nave windows constitute Marc Chagall’s only cycle of church windows in America, and the rose window is the last completed work of Henri Matisse, who finalized the design just two days before his death. 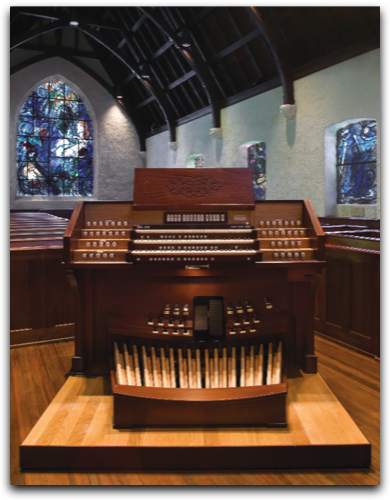 INSPIRED BY THE FAMILY'S affection for fin-de-siècle French culture, this stylistically focused instrument looks toward the orgues de salon of the era for its intense color in the context of a modern church organ. 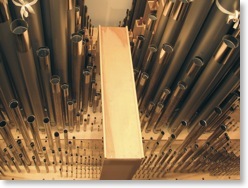 Dr. Gordon Turk, who presides over the famous Ocean Grove Auditorium organ, served as consultant.